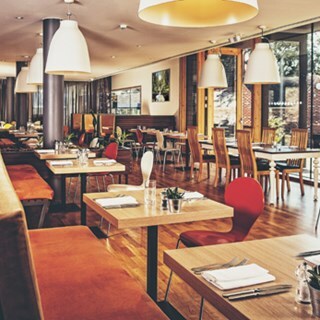 The Restaurant at Lifehouse Spa & Hotel is a light, airy and relaxed space with fantastic views out over the beautiful historic Listed Thorpe Hall Gardens in Essex. 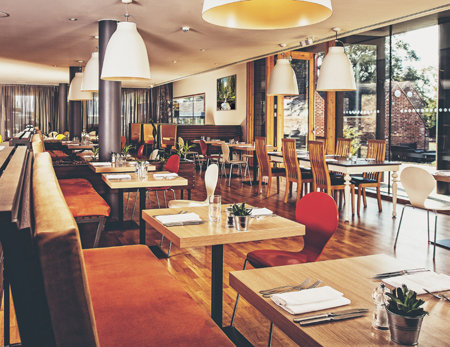 Overseen by Executive Chef Ugo Simonelli, the Restaurant is open daily, serving breakfast (hotel/spa guests only), lunch, afternoon tea and dinner, for both the hotel's guests and the local community. The fresh, vibrant Mediterranean-inspired dishes are all freshly prepared using seasonal local produce where possible. The relaxed and contemporary bar is also open to locals, who are welcomed to pop in for a coffee, cocktail or an Afternoon Tea treat whenever they fancy. The atmosphere is relaxed and informal, reflecting the tranquil ambience that flows throughout the rest of the resort. Food was average to be honest (sorry) and while the staff were lovely, service was very slow even during the quieter periods. Breakfast buffet was stone cold. Had a lovely meal and staff extremely friendly, hardworking and a credit to the restaurant. Delicious food, outstanding selection of alcoholic and non-alcoholic drinks and amazing service. Great value too! I will be back soon! Food was lovely but I am pretty sure I was given a gluten scone as I was quite ill afterwards and the cakes were mixed up so I think more awareness and training on cross contamination would be a good idea. I am coeliac so not  trying to be fussy or difficult it’s just it does make me quite ill and I did check and state my needs. The spa facilities are absolutely wonderful! Clean, calm, and inviting. We had a lovely room overlooking the courtyard. Very much enjoyed our bathrobes and slippers! The hidden sanctuary experience was incredible - we left feeling incredibly relaxed with absolutely glowing skin! The restaurant was lovely with delicious food and lovely staff. We will definitely be returning, worth every penny! Service was brilliant, friendly and welcoming. Afternoon tea was lovely, only criticism was that the bread for the sandwiches was a little dry as if it had been left out. Option for a different type of tea would have been nice but all in all was good. Our waiting staff were excellent and were attentive and catered for all our wishes. Jean as always greeted us with a warm welcome and remembered us from last time. She knew exactly what we was booked in for. All the restaurant staff were very helpful and very friendly. The food was exceptional as it was the last time we came. The chicken Marsala is the best please keep it on the menu! Lovely meal, fantastic waiting staff. Just one small negative, it's very noisy when full, maybe some investment in sound proofing acoustic panels could help reduce noise. Only negative was the 45 minute wait between sitting down for lunch and getting served the food, as no explanation was offered why there was a delay until we asked. Dinner was lovely, good service. We sat in the central aisle which was very dark even to an extent that is was very  difficult to fully read the menu. The afternoon tea was out very fast after  our booked time and very fresh food. The cakes were lovely. Everything was wonderful except for the fact that if you get seated by the windows and doors it’s very cold and draughty which ruins the atmosphere of the restaurant. We had a lovely stay. We got a very good deal so was excellent value for money. My only criticisms would be the rooms were too hot and we had no way to control the temperature. Being on the ground floor we only had a door to open rather than a window, so could not sleep with it open. The food at dinner whilst delicious, was not very hot by the time it got to us. There was a lovely Udo salad available which was Vegan and Gluten free but I think it lacked something like Tofu, or walnuts. The service was lovely but sometimes it was difficult getting someone's attention if you needed something.